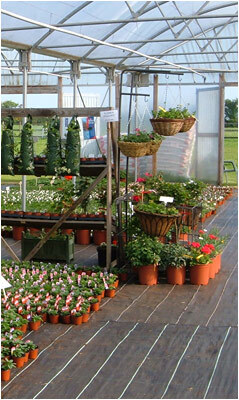 Potters Nurseries is situated at Barnston Farm near East Allington in The South Hams, Devon. Simon and Sarah run this family business, sometimes with the help of their children and parents. Potters Nurseries has been trading for 20 years and we have the largest stock of bedding plants in the South Hams. We open in May to the public and fill over 1000 hanging baskets, pots and containers as well as selling 100s of varieties of bedding plants, perennial plants climbers, roses and lovely pots and containers. We supply shops, hotels, pubs, Kingsbridge in Bloom, South Hams Council, Dartmouth and Kingswear councils, as well as individuals.